The power to deliver exceptional accuracy and EHR/PACS integration. Noise Cancellation technology for optimum speech recognition results. 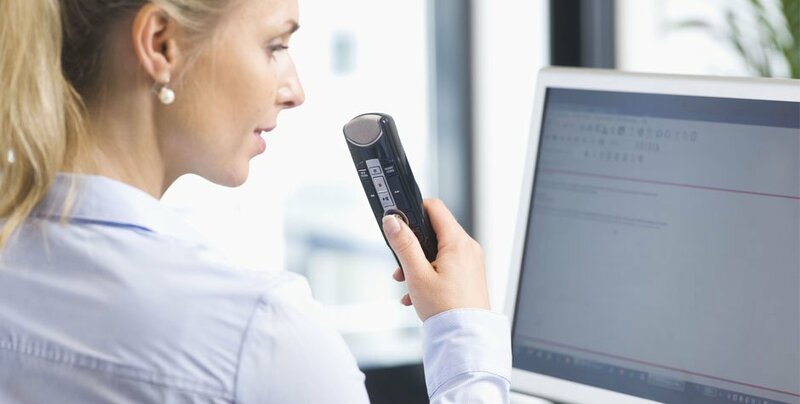 The combination of dual microphones and the innovative noise cancelling technology revolutionizes speech recognition accuracy when dictating – even in extremely noisy environments. The next generation of the RecMic Series provides one of the most advanced USB microphone and therefore fulfills even the highest user demands. Command Quickly and Quietly. No need to remember verbal commands. Intuitively positioned controls and superb ergonomics enable lightning-fast dictation and free you from unnecessary finger movements. Studio quality technology –and quiet construction also blocks unwanted but difficult-to-eliminate sounds such as breath and wind vibrations with a triple-layer pop filter, cushions “click-less” buttons, and a smooth surface coating. Antimicrobial – ergonomic – robust: perfect for daily clinic life. An antimicrobial surface supports hygienic requirements. This is why the RecMic II models are especially suitable for everyday clinic routines. The ergonomic shape and the extraordinary robustness of the products also meet the demands of the market.